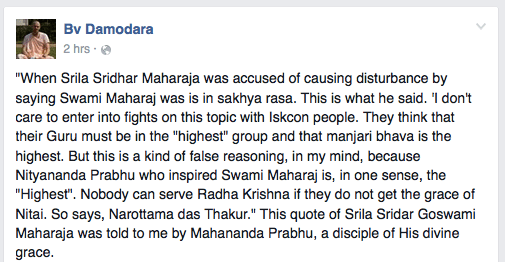 This entry was posted in Current affairs and tagged controversial, Rasa of Srila Prabhupada by Haridasi. Bookmark the permalink. Regarding rupanuga, Suddhadvaiti Maharaja’s response to Nemi Maharaja explains how priya narma sakhas are also rupanugas. Then there is another definition of rupanuga (the one Srila Prabhupada always used), and that is being a follower of Rupa Goswami (instead of Manjari). Any gaudiya vaishnava is in that sense a rupanuga. We all follow Bhakti-rasamrta-sindhu. And in Vaikhanas Maharaja’s response to the whole controversy, when speaking I whether a sakha can help someone aspiring for madhurya (priya narma sakhas also have madhurya btw) he brings out the point that Srila Bhakti Promode Puri Maharaja made: A guru like him can make all arrangements. I hadn’t seen that quote from Srila Bhaktisiddhanta, thank you! Very pertinent. The whole discussion is in a sense not about madhurya or sakhya, but about matter and spirit. It does makes sense that SP referred to other devotees, one good reason be that they had a different mood to develop. The Lord’s avesha manifestation took place in Pradyumna Mishra. In every town and village of the world, the chanting of My name will be heard. [CB. Antya 4.126]. So we know by sastra this is possible and our SP says as much in the Puport. Why this is significant is Nityananda according to CC was ” “always absorbed in the mood of a cowherd boy” so expressions statements made by SP would be Consistent with this. But the question is did SSM ever say anything about this embodied idea ? When the good ship Jaladutta was crossing the Atlantic Ocean en route to Boston Harbor on Sept. 13, 1965, Srila Prabhupada composed a beautiful prayer in his native Bengali language. The refrain appeals to Sri Krsna, who is bound by Radharani’s love. But then the next mystery what about his Madhurya mood ? In Bombbay concluding a class SP says ” intelligence means to go back home back to Godhead to dance with the lord in his rasa dance, to dance in the lords rasa dance will be our greatest pleasure” no male person can enter the rasa mandal not even Priya narma sakhas. So our aim will be to see how both existed , by accepting the analysis of SSM that while SP completely showed the mood, bhavas and power of Nityananda to accomplish preaching all over the world. In that avesh he could also give any rasa just as Madhavendra puri who gave Dasya to Advaita, to Nityananda ( this by influence since Nitai was the disciple of Laxmi pati Tirtha) and Madhurya to Isvara Puri. Also Niyananda shakti is Anaga Manjari. In conclusion this would also reconcile the Staements of SNM and SGGM , because after the work for which one becomes empowered is complete the avesh leaves the devotee and their own mood is fully manifest. Therefore when SNM was performing the samadhi he directly observed and spoke to SP at that time and confirmed he was in Madhurya there would no reason to lie about this and he was certainly qualified and others also bear witness to this who were personally present. Thank you and hopes this resolves things in a way that allows all to see SP according to their desire with dismissing the realizations of anyone. This is the perfect blessing of SP and our Gurus. There was a lot here I didn’t know much about – and I love it when I get challenged into going deeper into the siddhanta. The moods of the different associates is especially deep. You tried to explain it, but I still don’t understand one part. How can SNM only see SP in madhurya rasa? It also gives the sense that SNM didn’t see SP as a sakhya with madhurya, but as a manjari. Mukunda, the statement by Srila Sridhar Maharaja to Achyutananda was very general and meant to encourage the latter. 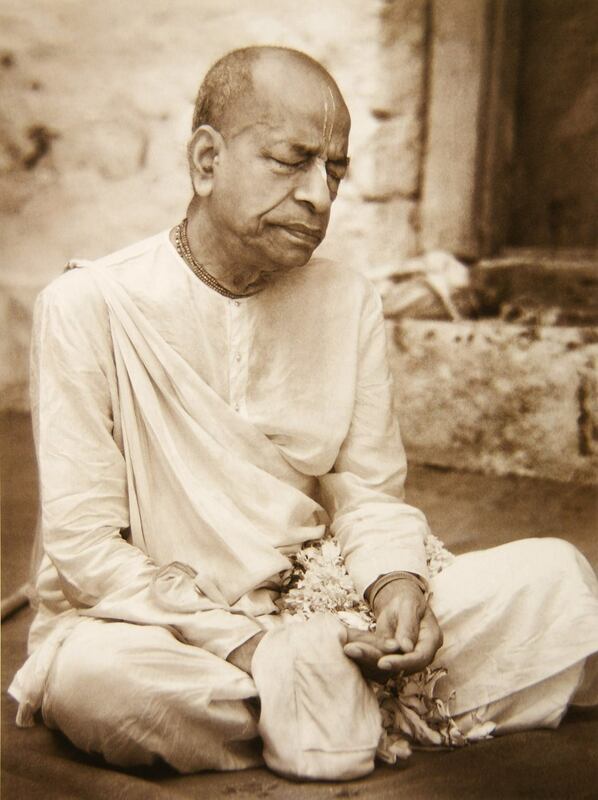 He said that because Srila Prabhupada was so attached to kirtan, he must be in madhurya-rasa. But the most famous kirtaniya among Srila Bhaktisiddhanta Saraswati Thakura’s disciples, namely Krishna Das Babaji, is a sakha. My comment went off before I had edited it enough. You are my senior, so I should word it differently. For the reason I mentioned in the comment above, I find Srila Sridhar Maharaj’s statement to be meant for encouragement only. Sorry left out Madhavendra puri by influence gave Sakhya to Nityananda . Point of note also: Srila Rupa Goswami has explained that Narada has what is called Svaccha rati and it is unique to him svaccha means he reflects the mood of what devotee he associates with from Naradiya Gopi, to Madumangal , to Narayana Sevak all he will manifest. Thank you! This explains Narada Muni to me and why he seems to be everywhere with different manifestions and moods. Please accept my heartly dandavat pranams. All glories to Sri Sri Guru and Gauranga, all glories to Sri Sri Radha Vinode Bihariji. What a beautiful letter! Thank you for sharing this with me. You don’t happen to have the date of this letter? I can’t find the exact date now, but it was shortly before his passing from the world. I said the same thing in a reply above, but I will try again here (in hopes Syamananda Prabhu also has something on this). How can SNM only see SP in madhurya rasa? It gives the sense that SNM didn’t see SP as a sakhya with madhurya, but as a manjari. One way I’ve heard it was that your Gurudeva was so absorbed in manjari bhava that he projected it on others. That’s not a problem at all. Some say that vaishnavas on that level can clearly see the svarupas of one another, but if you want to take Srila Sridhar Maharaja’s both statements literally, his example says something else. Still not a problem! If Gurudeva projected manjari bhava unto SP, that’s a reasonable explanation, but I also agree that vaishnavas at that level should (with an emphasis on should) clearly see the svarupas of others. So this is a mystery so far, a mystery I’m coming to believe it takes another pure devotee to explain. But I agree in that this is not a problem. It seems like many takes this issue as a threat to their Guru nistha (and if so I think they should hold on to their belief). Me – I look at the evidence and see an unexplained contradiction that I can live with until it is explained. Things such as these always are revealed in due time. And when they are revealed – I will revel in the explanation. “Revel in the explanation”, jaya! Lilasuka’s post also indicates the other possibility, that your Gurudeva knew Srila Prabhupada might be a sakha, but to help his disciples he didn’t emphasize that. Because immature disciples might see that as trying to downplay Srila Prabhupada. That’s what happened when Srila Sridhara Maharaja said that Srila Prabhupada is in sakhya rasa. Srila Narayana Maharaja saw both same as Srila Sridhar Maharaja they agree that Srila Prabhpada accepted the avesh of Nityananda keeping his own Bhava hidden, when the work of preaching was complete whe was entering nitya Lila Srila Narayana Maharaja was there serving and communicating directly with Srila Prabhupafa, they private exchanges that is acknowledge by all present there. Seva rendered was according to Srila Prabhupafas expressed desire, so he was revealing his own mood which Srila Narayana maharaja saw and it was Manjari Bhava, we don’t have another source who was there and privy to what was exchanged and we would not accuse obviously a pure vaishnava of lying or fabricating. So it clearly accomadates how Srila Prabhupada manifested both during his preaching lila and manifested his own mood in the end. Hope this is helpful. All pure devotees have to keep their bhava hidden during manifest pastimes. So we have a situation where Srila Sridhar Maharaja and Narayana Maharaja’s opinions apparently contradict each other. I don’t believe any of them are lying or fabricating anything, which is why this becomes an interesting contradiction. I see this as an opportunity to understand my Gurudeva even more, though the answer isn’t clear yet. I don’t buy that SP is in manjari bhava as too much contradicts it. I found this explanation to be a good one: https://www.facebook.com/notes/1037046769642184/ and I will follow that discussion further. Though, this continue to explain why SP wasn’t a manjari, but not why NM said SP was a manjari. My intent is not to enter that discussion as I don’t have any knowledge to do so. My interest is in understanding why NM and SSMs statements contradict, though I understand that in your opinion there is no contradiction. Wow, really loved Lilasuka’s comment on that post! Dandavat some clarification all pure devotees do not require to supress their Bhavas what they checking (when they can are Anu bhavas which are feelings that arise do to being stimulated by something example is once Srila Prabhu was chanting Jaya Radha Madhava and became overwhelmed by abubhavas and could not check them so devotees saw something of them, but it was not always he did like that, here it means he supressed his Stayi Bhava or intrinsic mood to accomodate the avesh of Nityananda please read the story of Nakula Bramachari in CC Antya Lila Ch 2 , it says Mahaprabhu entered his body he became like a ghost of course not in a bad way it was that his own moods were supressed to serve the lord by allowing the lord to Manifest in his body an note the doubt of Sivavanada Sena to prove that this was not an ordinary event. Please read the last page of the original post for more info, on this if you line. Not sure how this relates to Srila Gurudeva expressed convictions on this subject unless he then told you he is showing mercy to everyone by telling that our Srila Prabhupada was really in Sakya rasa, it was this hard evidence that we were looking for though the above statement is certainly a deeply expressed point by Sri Gurudeva it is not the same as holding the same conviction without change even while entering Samadhi, an interesting point here is also Srila Prabhupada while performing his samadhi pastimes expressed the desire for forgiveness from his God brothers for anything that may have been taken by them as aparad and in the course of that he says “sometimes we say things for preaching” is it at all remotely possible that many of the statements used as praman besides the Jaladhuta prayer are statements to new devotees, and to reveal your svarupa to someone in a car ride who has been in the practice less than 2 years especially given the temprament of the disciples of SBSST regarding such things . In comparison the weight of the evidence of Srila Gurudeva placing Srila Prabhupada in samadhi with all the udddhipan and seva rendered under the conception of his being a Manjari servant following his own Gurudeva, which was also confirmed by Srila Gour Govinda Maharaja, certainly is strong. I have not kept up here with responses but I will say we must be careful when assessing or interpreting the intentions of pure Vaishnavas we don’t have any statement from either my Guru maharaja or Srila Sridhar maharaja confirming they spoke ” to encourage, or to help disciples come to Madhurya rasa since Srila Prabhupada was in Sakhya, the direct quote from both of the above mentioned self realized Vaishnavas is he supressed his own Bhava to accomodate preaching, they both directly mention Srila Prabhupada to be shakyavesh of Nityananda, ( this is not in the same sense as all who perform the function of Guru are Nityananda empowered) When this was first mentioned by Bhakti Vichar Yavara Maharaja it was met with skepticism and was finally resolved by Srila Sridhar Maharaja. Of course the disciples of Srila Siddhanta Saraswati thakur knew guru tattva so they were doubtful about Srila Prabhupada being empowered as all Gurus are, rather they were skeptical like Sivananda Sena who doubted that Mahaprabhu had entered the body of Nakula Bramachari until it was proven when Nakula mentioned the mantra of Sivananda Sena whic was known only to the istadeva of the mantra Mahaprabhu himself so sastric praman has long been established for this and if Mahaprabhu entered the body of Nakula Branachari to deliver Bengal is it at all unreasonable he entered the body of Srila Prabhupada to deliver the whole world and that as mentioned by both SSM and SNM SP supressed his own Bhava and defered to that mood and empowerment to preach. Members at KB ashram wrote a long refutation of this citing rasa siddhanta , which was replied to with Srila Jiva Goswami’s Priti Sandarba anuched 178 which shows that seemingly contradictory mellows are reconciled by the Achuntya shakti of the lord for his special pastimes with eligible devotees so the only remaining question was rather they considered our Srila Prabhupada an eligible devotee. This is already quite long so I will conclude with the sound file of SSM reconciling with his own words it is a direct answer to the question of Srila Prabhupada being in Sakhya rasa and why he “Temporarily Showed like that” the question starts just after min:38:00 but the whole Katha is beautiful as he also explains Rupanuga clearly. Thank you for your comments Mukunda Prabhu, and for taking the time to respond.